When planning to construct a “Cold Room” or “Seed Storage Room” for the purpose of preserving seed viability, one must first consider principles for optimum seed storage. In ECHO Asia Note 14 (July 2012), we shared results from our comparison of vacuum sealing versus refrigeration, and highlighted the importance of moisture control and temperature control in seed storage. We found moisture control (vacuum sealing) to be more effective in maintaining seed viability than temperature control (refrigeration). It is ECHO Asia’s experience that seeds are best stored in the tropics by first using vacuum sealing after drying (to preserve low seed moisture content), then storing the packaged seeds in cool temperatures. When designing a cold room for optimum seed storage conditions, good insulation and cooling are important; however, without a proper moisture barrier, the cooling process will draw moisture from the outside and create condensation, leading to increased moisture content. In cases where seeds are not also stored in vacuum sealed bags themselves, or when the seal on the vacuum-sealed bags breaks, this additional moisture can damage seeds. Many different materials can be used to construct a cold room that will be both efficient and preserve seed viability. Ask yourself, “What locally available materials have a high insulation value and are not subject to moisture penetration?” In most circumstances, the answer to this question will include a combination of materials. For instance, if you know of a natural material that insulates well but is subject to moisture retention, mold, and/or decay, a moisture barrier (such as plastic) may be able to be used on both the inside and outside of the building. Consider also both floors and walls when thinking about moisture and insulation; the floor is just important to protect from moisture retention and temperature loss as the walls. Note that if you construct a cold room in a humid climate, it will be nearly impossible to keep all humidity out of your room. As you cool the room, humidity levels will increase and natural materials will absorb and retain the moisture. The percent relative humidity can be thought of as the actual amount of moisture in a given volume of air in proportion to the amount of moisture a given volume of air could hold at a certain temperature in a given environment. Warm air can hold more moisture than cooler air. Percent relative humidity is typically inversely related to temperature; that is, as temperature decreases, the amount of moisture the ambient air could hold decreases, leading to increased relative humidity, because that volume of air is more saturated than at a higher temperature. This is why very cold storage containers, like refrigerators, have very high relative humidity, which can damage unprotected seeds. Seeds are living organisms and will equilibrate to the ambient relative humidity even after being dried to an optimum 3-10% seed moisture content. Storing seeds in a refrigerator is not good for seed viability, because of the high moisture content. Seeds stored in a vacuum-sealed container will fare better in a refrigerator, but such storage conditions are still not optimal because of the high relative humidity. If you build a cold room attached to or amongst other buildings, consider placing it in a location that will maximize its efficiency. In the Northern Hemisphere, the southwest corner of any building without shade trees will be the hottest part of the building. Likewise, the northwest corner in the Southern Hemisphere of any building without shade trees will be the hottest side of the building. It will be most efficient to build to the northeast side of any existing building in the Northern Hemisphere, or the southeast side of any existing building in the Southern Hemisphere. Incorporating shade trees can also help moderate temperature. Avoid windows, because natural light encourages seeds to metabolize their nutrients in preparation for germination, reducing their shelflife. (From Left to Right): The old cold room seed storage area, a close up of an AAC block, the new cold room under construction, and the new cold room once the walls had been built but before insulation. ECHO Asia produces and distributes an increasing quantity and number of varieties of seeds. We recently had to modify our cold room and add a second room in order to boost our capacity and increase the efficiency of the storage room. The original seed storage room is located in a building with a metal roof and a drop-down tile ceiling. Because it is a corner room of a pre-existing purpose-built structure, it had two existing windows on two walls. 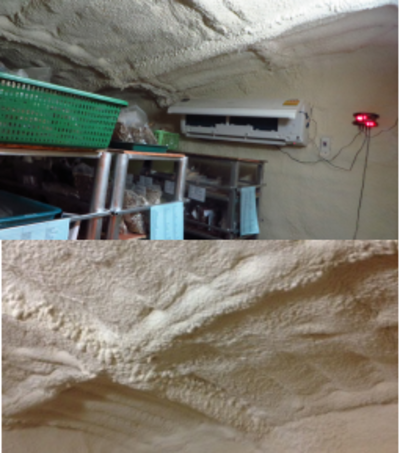 We placed fiberglass insulation above the tile ceiling and lined the walls with 50mm thick Styrofoam sheets. The room was cooled with a 9265 BTU/h split air conditioner that we modified with a CoolBot purchased from Storeitcold.com. The CoolBot served as an easy do-it-yourself modification; it does not require expertise to install, nor does it negate the warranty of the air conditioner. A CoolBot overrides the internal thermostat and allows an air conditioning machine to run colder. With the air conditioner and CoolBot together, we tend to keep our old seed storage room at about 10–16°C. We ran a dehumidifier in the room to help regulate the amount of condensation from the cold temperatures. This cold room worked well, but was not very efficient (owing to the conversion of a regular purpose-built room), did not regularly cool the room below 15°C, and also had a tremendous amount of condensation that accumulated and dripped through the dropceiling tile. We learned that the ceiling was not insulated enough to overcome the dew point of the ambient air in the ceiling space above the room, nor was the ceiling watertight. When water condensed on top of the drop-ceiling tiles, it pooled and found its way into the room, increasing the moisture content of the room. Figure 1: The design for the new storage room, adjacent to the old room. Figure 2: The floor for the new room was constructed with layers of a plastic sheet, Styrofoam, cement, AAC blocks, and a sheet of plywood. concrete block that is lightweight, provides insulation, and is mold-resistant. AAC is increasingly available in Thailand as a highly insulated, easy-to-use building material that is made from cement, aluminum, and other agents which undergo a chemical reaction to form hydrogen bubbles, which are trapped in the cement and lead to a very porous, highly insulated block. We laid a layer of these AAC blocks on top of the concrete floor, finally topping all of this with plastic and plywood sheeting to diffuse weight (to avoid breaking the brittle AAC). The room uses a traditional post-and-wall construction with four load-bearing posts at the corners made from traditional reinforced cement. We used AAC blocks to construct the new walls of the cold room, and to line the preexisting walls where the cold room joined the existing building. A metal girder roof with asbestos tiles ties the walls and posts together. Wesprayed 25mm-thick spray foam insulation on all four walls and a 50mm spray on the bottom of the roof, rendering the walls and roof well-insulated and impermeable to moisture (in essence, a vapor barrier and insulation in one package). A 15,000 BTU/h split unit air conditioner with a CoolBot was installed to provide cooling capacity. This new room is kept around 4⁰C quite easily by the new air conditioning unit with CoolBot. (FromTop to Bottom): The cold room is run off of a single air conditioning unit and a Coolbot; the cold room was insulated with spray foam. In order to create more efficient usable space, we also remodeled our original cold room during the construction of our new cold room. We replaced the existing hollow plastic door with a solid core PVC (polyvinyl chloride) door in order to provide better insulation and a moisture barrier. We removed the windows; one became the doorway to our new cold room and the other was filled with concrete AAC blocks. We sprayed the ceiling with a 50mm thick spray foam insulation and the walls with a 25mm thick spray foam insulation to improve efficiency and provide a moisture barrier. This renovated room is typically kept at 16⁰C. It acts as an airlock to the colder room and as a temporary inventory storage space. It also provides working space for Seed Bank staff to take inventory and to vacuum seal seeds. Since the completion of this new seed storage room, ECHO Asia staff members have noted several differences between the old seed storage room and this new design. Despite now running two air conditioning units rather than just one, there hasbeen a negligible increase in the overall monthly cost of electricity at the Seed Bank. Since completing the new room and making changes to the old room, we have seen no sign of water from condensation. Lower humidity in the room means that staff members no longer have to run the dehumidifier in the seed storage space. 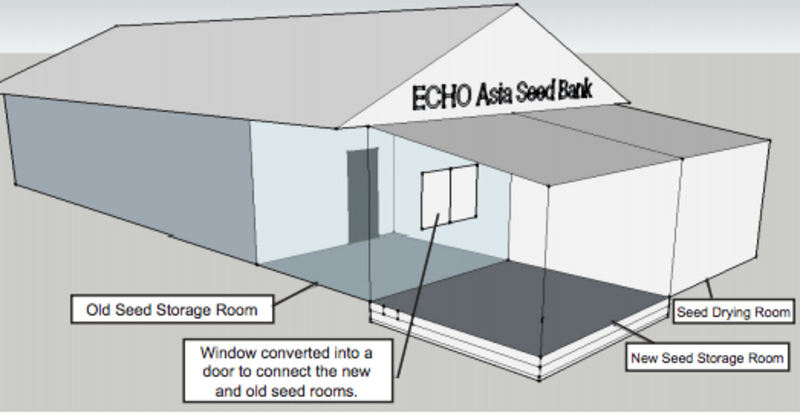 Finally, because of the insulation, the new room is a much cooler storage space than the old room, and even the old room is now cooler than it had been previously – providing a safer space to protect ECHO Asia’s seeds. Table 1 contains information about the costs of building this new cold room. The most expensive specific items were the air conditioning unit, the foam insulation (including labor), and the cement AAC blocks. This cold room design is not meant to be promoted for individual farmers’ use, but could have some applications in nonprofit or larger settings. Locally available and more affordable substitutions for some items might also be available, such as using a wooden door and painting it with latex paint (so to prevent moisture), using foam sheets instead of spray foam insulation, and using traditional brick and plaster instead of Q Con Blocks. Table 1: Costs of the seed storage room in USD and THB. Materials used and price of materials may vary depending on local context. A seed storage room of this capacity will not be appropriate for every situation. However, the principles, ideas, and materials mentioned in this article may offer starting points or solutions for nonprofit and community seed banks working in a similar context. If you would like to build a cold room, first consider the needs of your situation and what materials are readily available to you in your context. Then decide how you might best create a safe space for your seeds.